✔ Newest - MAGICAL - MARVELLOUS -Unique INFINITY CUBE TOY: bring you endless finger pleasure by flip and fold it constantly to transformate different infinity shapes. Meet all your hands\' needs-Once touch it, your fingers wouldn\'t stop whether play it by one hand or two hands. Buy it now to feel like your fingers are dancing Latin or Chinese allegro with audible click sound. ✔ Perfect HAND TOY Best Gift Idea: this fidget toy cube is for all ages, adults & children; For all places-at work & school & home; For all time when needs focus attention,relieve stress & anxiety to have a deep relax and release;Pocket Size-small & lightweight & easy to carry anywhere. ✔ENVIRONMENTAL RECYCLABLE HIGH QUALITY MATERIAL - Composed with eight (8) tough ABS plastic blocks linked together with strong hard bearings. DURABLE -It can withstand constant flipping and folding for \"a million times\". Pass the DROP TEST of 2M height. ✔ Ergonomic Curved edge and Smooth surface DESIGN for hand comfort and long term usage. 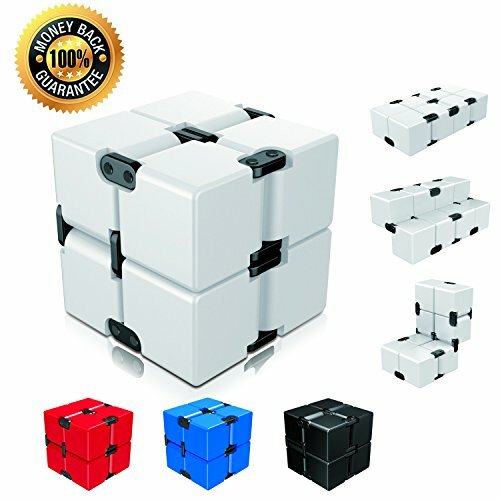 PACKAGE INCLUDES: 1* infinity cube (stickerless) + 1*box. FULL MONEY BACK GUARANTEE: no worry, we provide satisfied guarantee if you don\'t like it. ✔ Warning: not for children under 3;children of age 3-7, need play under the adult supervision. The legitimate seller of this product is only icicoo, Buying fake will affect your shopping experience and get no after-sales service.